The Queensland International Student Advisory Panel (QISAP) is an initiative under the International Education and Training Strategy to Advance Queensland 2016-2026. QISAP gives students a voice in the implementation of the strategy. The Queensland Government worked with the Council for International Students Australia (CISA) to co-create the QISAP model. QISAP membership is selected at the start of each year and is comprised of international students representing different nationalities, gender, levels of study, and regions of Queensland to harness the diversity of the international student voice. QISAP advises Study Queensland on key issues international students face living and studying in Queensland and also co- designs the International Student Leadership Forum (ISLF) and the International Students Meet Parliament (ISMP) events held each year. In 2017 QISAP membership spanned 10 nationalities, 6 different regions of Queensland, and included students from Vocational Education and Training, English Language, and Higher Education. QISAP consists of 12 students selected based on their commitment and ability to represent international students in their region and sector. 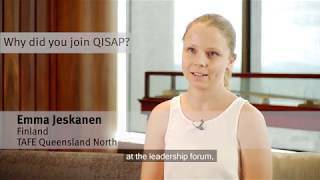 This year the QISAP program will include two domestic students. Membership is refreshed every year and Study Queensland is looking for engaged international students to nominate for the 2019 program! We encourage anyone who is interested to download the guidelines and then follow the link to apply! Stay tuned for more information about 2019 QISAP applications. What is the IET Strategy? Study Queensland profiles Queensland as a leading study destination through a digital presence (website and social media) and as a holistic Queensland brand that is managed by the International Education and Training Unit. It highlights Queensland as a leading study destination, showcasing excellence in education, quality of life and general information for international students. It works with existing and developing regional study clusters such as Study Brisbane, Study Gold Coast, Study Cairns to attract more international students to Queensland. The Council of International Students Australia is the national peak body for international students. CISA focuses on advocacy and holds the annual national CISA conference where international students come together to network and discuss possible solutions to issues international students face. Organisations such as student unions are able to become a member of CISA which allows them access to the resources and network CISA provides as well as voting rights and the ability to run for a CISA executive position. Participation in QISAP does not require a CISA membership. Study Queensland partnered with CISA to design the guidelines and objectives of the first Queensland International Student Advisory panel in 2017. Now that the program is two years old, CISA’s primary function on QISAP is to contribute their individual international student voice and gain perspective on state wide issues from the other members of QISAP. What is the difference between a study cluster and Study Queensland? Study Queensland is the holistic Queensland brand managed by the International Education and Training Unit for Queensland Government. In contrast regional Study Clusters are organisations made up of members of local institutions/ providers, city councils and other identified stakeholders interested in attracting international students to their specific region. Most study clusters have Student Ambassador Programs which selects current international students to promote the region using their social media networks. Queensland Government and local government work in partnership to promote Queensland as a study destination. Student Ambassadors are students selected by study clusters (Study Brisbane, Study Gold Coast, Study Toowoomba, Study Cairns, Study Sunshine Coast) or institutions to promote and market the region/ institution as a study destination – usually via social media, blogs and networking events. Student Ambassadors are provided opportunities to participate in educational and recreational activities organised by study clusters/ institutions. Ambassadors take a stronger role at the city level working with local governments and mayors/councilors and in the community. While the QISAP is encouraged to share their experience in the program through social media that’s just a by-product of our work. We also see the role of Student Ambassador and QISAP as complementary. Some members of QISAP fit all 3 categories- student ambassador, CISA member and QISAP. What gap does the QISAP fill? As a member of the QISAP you are partnered with the International Education and Training Unit in Queensland Government to provide your voice and insight as an international student. You will advise on policy and programs being delivered that are focused on enhancing the international student experience. The QISAP is truly an advisory group rather than an advocacy group even though there are opportunities for advocacy. How much time will I need to set aside for this role? The two biggest tasks you will have is your local international student engagement and the Queensland International Student Leaders Forum. Both tasks will require you to plan and create content so you will need to set aside time for this. Throughout the year it is best to take an hour to prepare yourself before every meeting whether it is in- person or through video- conference. I’m an international student at a high school, can I join the QISAP? You have to be 18 years or older to be a part of the QISAP program. If unsure you should contact your school to see if you are eligible. If you are a school or an under 18 student – watch this space- we have some new ideas for programs and panels in 2019 to support under 18s! Is every event/ meeting mandatory? Study Queensland hopes that every student who nominates is committed to the entirety of the program however we understand that studies come first and things come up. We are flexible with arrangements and try to adhere to every panelist’s needs. At the end of the day you decide how engaged you want to be in the program but we expect a high level of commitment if chosen to be a part of the program. What is the International Students Meet Parliament (ISMP) Event? ISMP is one of the primary outcomes of the QISAP program which includes a two-day leadership forum known as the Queensland International student Leaders Forum (QISLF). It is an event to provide information on the IET strategy, leadership workshops, professional development, a chance to meet members of parliament, and networking to international students in Queensland. The second ISMP and ISLF was held on October 15-16 2018 in Brisbane which hosted close to 100 international and domestic students from 42 nationalities. The goal of the events is to raise the profile of the importance of international students in Queensland as well as strengthening regional/ local international student communities by bringing together international students across Queensland to network and grow as leaders. The moderation panel is made up of 3 members. You will be advised of your nomination success by 25 March 2019.
Who can write a reference letter? I am interested in becoming a member of the Queensland International Student Advisory Panel (QISAP) for Study Queensland. The panel provides advice to Study Queensland on policy and programs relating to international student experience in Queensland and partners in designing the Queensland International Student Leaders Forum and International Students Meet Parliament event. I would be good for this role because ________________________________________________ and would appreciate your support in writing me a reference, the deadline for nomination is 15 March 2019.